After our long visit with Angel’s Casino, let’s move on to memories of the vehicles that transported us to Angel’s and those other teen hangouts of the 1950s-70s. Chuck Berry’s song lyrics said it all when it came to teens with cars in the 1950s: Cruising the streets and listening to the radio without any real destination in mind. Except maybe riding up and down State Street in Sharon, PA, on a Saturday night to see and be seen. The impact of the 1950s automobile culture on America is explained well on this Wikipedia page, but our own stories on the subject add personal details, re-connecting us to those times in a more visceral way. Here’s an article written in 2013 by Irene Caldwell O’Neill (SHS 1960). For more about Irene, click here. In the early 1950s automobiles weren’t yet considered a necessity, only a luxury and a convenience. The Shenango Valley had dependable public bus service, trains ran to the larger cities, and people were accustomed to walking distances of one to two miles. Probably less than half of Sharpsville’s families had cars. If there were roughly a thousand families in a population of five thousand there would have been less than five hundred cars in all of Sharpsville. They weren’t very dependable and most owners didn’t have any mechanical skills, including my dad. He could change a tire and that was about it. Our pre-WWII Plymouth was completely black with four doors, rounded fenders and running boards. It was parked in the alley behind the house during the summer and on the street in front in the winter months. I guess it was easier to shovel the snow away there. 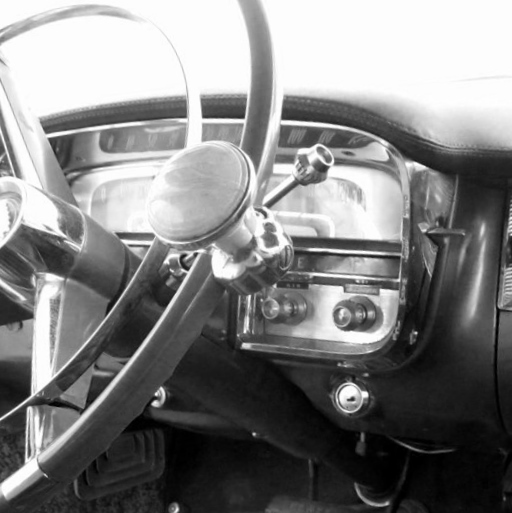 I loved to sneak inside the car, sit in the driver’s seat and play with the knobs and buttons on the metal dashboard. I’d try to turn the huge steering wheel (with little success) and caress the round horn mound in its center, always longing to touch the three-masted sailing ship pictured inside. This car had a starter button to be pressed when the ignition was keyed on and I quickly determined that the button alone made the engine try to start. The first time I pressed it and the car lurched forward in the alley, I was so scared and certain to be caught that I jumped out, slammed the door and hid up in the maple tree for a half hour watching the back door for either parent looking to grab me. Almost every Sunday, our family piled into our car and drove over the Shenango River bridge to my grandmother’s house near Brookfield, Ohio. Shortly after crossing the bridge, we entered farm country, so different from a steel town. Each week we passed the same large fields dotted with dairy cows munching grass and the same lovely barns standing in the distance. I knew every farmhouse along the way and stared at each one trying to feel inside for the stories that lived there. [My brother] Jack and I counted cows on our sides of the car; the winner had the most cows when we got to Grandma’s. We took that Plymouth to the Hickory Drive-in movie theater one cold autumn night. At the end of the show, Dad realized we had a flat tire and opened the trunk to get out the jack, lug wrench, pump, and patch kit. Spare tires weren’t a common accessory. We all remained in our swaying seats while Dad jacked up the car, removed the tire, pried out the inner tube and patched the hole. It seemed hours went by. Occasionally we’d hear a cuss word but no one inside made a sound. I can still hear that pump going up and down, filling the repaired tube. Then the jerking and banging as he put the tire back on and tightened the lug nuts. When the jack was released and the car settled to the ground we all let out a deep breath and relaxed. My brother and I sometimes played a “your car, my car” game while sitting on our front porch steps. We each took alternate cars as they drove by on Ridge Avenue, causing hoots of derision for old bangers and gloats of glee for newer shiny models. We particularly liked certain Studebakers because of the unusual look-a-like front and rear ends. Teenage boys started acquiring their own automobiles as soon as possible; having wheels was a big, big deal. Many boys left school before graduation and found employment at one of the mills. With a steady paycheck, they could buy a used car and they soon became experts at fixing any mechanical problem as well as customizing and “souping up” their vehicles. There was a great deal of status attached to owning a hot and fast car and made it easier to attract friends and girls. I remember one Sharon boy having what was called “a suicide knob” attached to his steering wheel [to facilitate single-hand steering before the advent of power steering]. — Irene Caldwell O’Neill (SHS 1960), Escondido, CA, March 2013.